An ancient city on the banks of the Ganges, Haridwar has been an important Hindu pilgrimage center since time immemorial. On the 15th (Wed), contemplate in the serene atmosphere at Mansa Devi Temple and then contemplate in the serene atmosphere at Ganga Aarti at Haridwar. Get ready for a full day of sightseeing on the next day: take in nature's colorful creations at Swami Vivekanand Park, contemplate in the serene atmosphere at Daksheshwar Mahadev, then make a trip to Shanti Kunj Gayatri Parivar Haridwar, then contemplate in the serene atmosphere at Har ki Pauri, and finally contemplate in the serene atmosphere at Chandi Devi Temple. Planning Haridwar trip won't be overwheling when you use's Insprock itinerary maker. New Delhi to Haridwar is an approximately 3-hour flight. You can also drive; or take a train. Wrap up your sightseeing on the 16th (Thu) to allow time to drive to Mussoorie. On the 17th (Fri), take in the dramatic scenery at Kempty Falls, look for gifts at Hamers, then make a trip to Lal Tibba, and finally take a peaceful walk through Jabarkhet Wildlife Reserve. For reviews, more things to do, maps, and tourist information, refer to the Mussoorie tour itinerary planner. You can drive from Haridwar to Mussoorie in 1.5 hours. Another option is to do a combination of bus and taxi. Finish up your sightseeing early on the 17th (Fri) so you can travel to Badrinath. Badrinath is a holy town and a nagar panchayat in Chamoli district in the state of Uttarakhand, India. Kick off your visit on the 18th (Sat): contemplate in the serene atmosphere at Brahma Kapal, take in the spiritual surroundings of Tapt Kund, then take in the spiritual surroundings of Mata Murti Temple, then take in the dramatic scenery at Vasudhara Falls, and finally contemplate the long history of Bheem Pul. For where to stay, maps, and more tourist information, read Badrinath itinerary planner . You can drive from Mussoorie to Badrinath in 11.5 hours. Wrap up your sightseeing on the 18th (Sat) to allow time to travel to Almora. Almora is a municipal board and a cantonment town in the Almora district in the state of Uttarakhand, India. Kick off your visit on the 19th (Sun): contemplate the long history of Dwarahat Village, contemplate in the serene atmosphere at Chitai Temple, take an in-depth tour of Archaeological Museum Jageshwar, then make a trip to Jageshwar Dham, and finally contemplate in the serene atmosphere at Kasar Devi. To see traveler tips, where to stay, and tourist information, read our Almora trip itinerary builder site . You can drive from Badrinath to Almora in 9.5 hours. 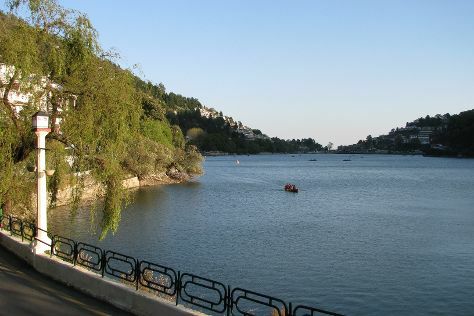 Wrap up your sightseeing on the 19th (Sun) early enough to drive to Nainital. On the 20th (Mon), explore the activities along Nainital Lake, then contemplate in the serene atmosphere at Goddess Naina Devi, and then look for all kinds of wild species at Pangot and Kilbury Bird Sanctuary. To see other places to visit, photos, ratings, and tourist information, use the Nainital trip builder . Traveling by car from Almora to Nainital takes 2 hours. Wrap up your sightseeing on the 20th (Mon) to allow time to travel back home.